Saturn's rings disappearing! Then come back. Saturn's rings: Saturn's icy rings shine in scattered sunlight in this view, which looks toward the unilluminated northern side of the rings from about 15 degrees above the ringplane.Courtesy NASA/JPL/Space Science InstituteAstronomers say that Saturn's rings will disappear from view on September 4, 2009...only to reappear three months later. Learn more here. Cassini-HuygensThe Cassini Huygens mission to Saturn just passed its ten year mark. 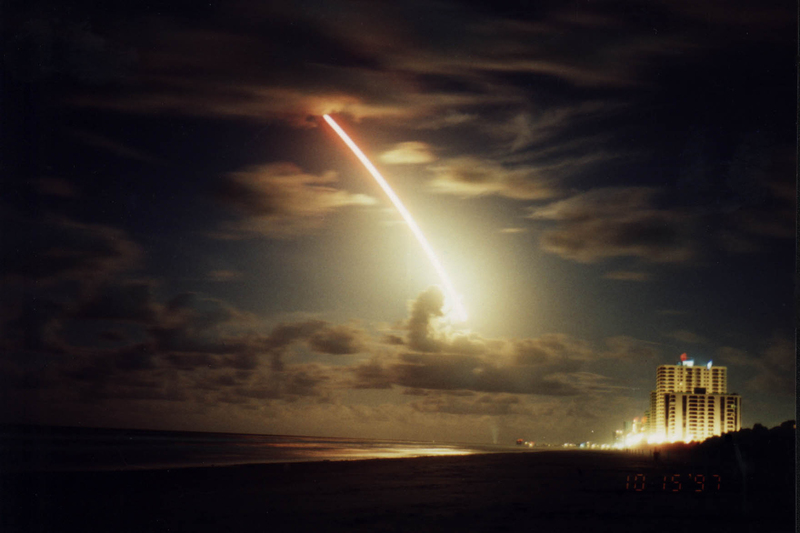 It blasted off from Earth on Oct 15, 1997. I hooked up my computer to the internet a month later, and have been enjoying photos from it ever since. Last year for Paul McCartney's 64th birthday, sixty-four images from Cassini were put together into a poster and a movie. Cassini flew by Jupiter on the way to Saturn . Cassini approached Saturn in mid-2004. One of my favorite photos is titled, The Dragon Storm. You can click through all of the Cassini photos by starting on this Cassini Imaging Diary page. 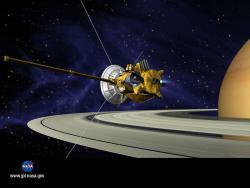 The term "Huygens" refers to a probe attached to the Cassini craft. On Christmas Day, 2004 it separated itself and landed on Saturn's moon, Titan (click here to access videos and photos). If you haven't been following this exciting mission, you have ten years of catching up available. Iapetus: This Cassini spacecraft view shows how the bright and dark regions on Iapetus fit together like the seams of a baseball. Image courtesy NASA/JPL/Space Science Institute.There are copies of Science News in my area of cube-land here at the Science Museum by the box of interoffice envelopes. The cover of the August 18 issue caught my attention – “Oddball Iapetus”. The title of the cover story is even better, “Idiosyncratic Iapetus”. Nice alliteration. 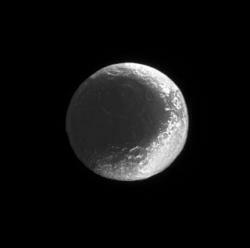 And, yeah, Iapetus is weird. Beyond the fact that in Greek mythology, Iapetus is the Titan son of Uranus and a moon of Saturn (you’d think that Iapetus would be a moon of Uranus) it is oddly colored and oddly shaped. The moon is two-toned, and the reason for this is not exactly known. The darker surface might have been caused by any number of things – it could have even come from one of Saturn’s other moons. Some theorize that micrometer impacts on the moon Phoebe or Titan knocked the material loose and it was then swept up by Iapetus. Or perhaps when the cosmic collision that created the moon Hyperion occurred it produced debris that ended up covering part of Iapetus. Or if not from another source, the odd color could originate from within Iapetus, brought to the surface by meteor impact and/or cryovolcanism. AND what is way-copasetic and that I didn’t know until I started writing this blog, was that the Cassini spacecraft performs its closest flyby of its entire mission of Iapetus, TODAY, passing by about 1,000 miles of the moon – the closest any spacecraft has come to Iapetus. Read more about that here. 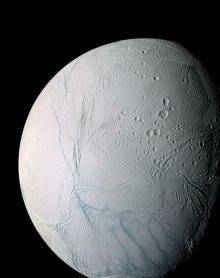 Enceladus: This is an enhanced color view of Saturn’s moon Enceladus. 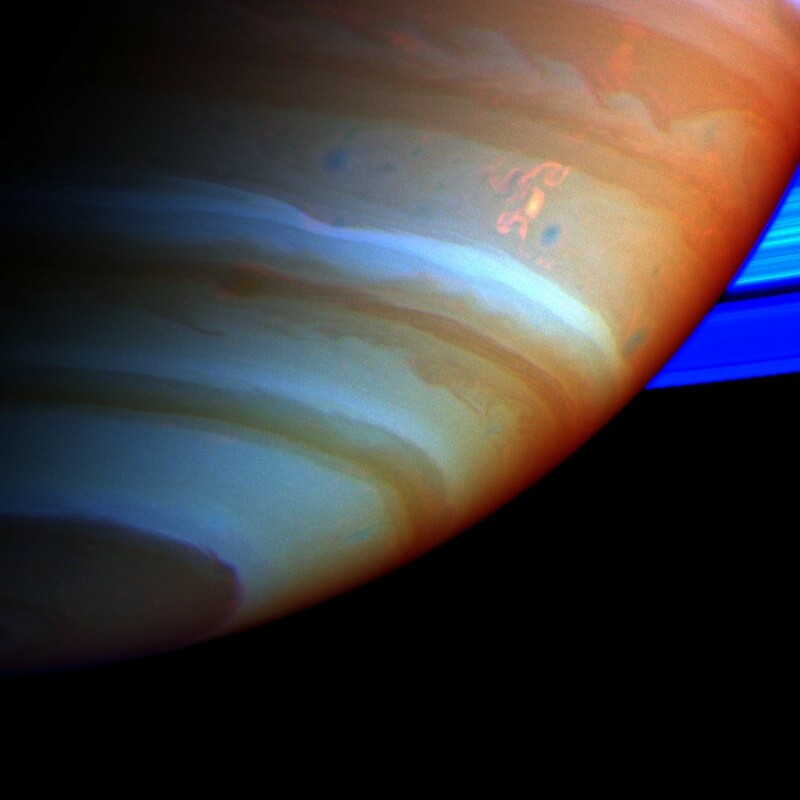 The image is a mosaic was created from 21 false-color frames taken by the Cassini spacecraft. Image courtesy NASA/JPL/Space Science Institute. The Cassini spacecraft currently in orbit around Saturn is sending back incredible images of the ringed planet and its moons. Its next flyby of Saturn’s moon Titan is tomorrow, at around 3:30 am Central Time. The flyby tomorrow will be used to determine if Titan has a subsurface ocean. Like most other NASA missions, there is a lot of material to whet your appetite for space information. There are video updates from the Jet Propulsion Laboratory (JPL), image galleries, and even an opportunity to vote on your favoriate image from the Cassini mission. The Cassini spacecraft is a joint project between NASA/JPL, the European Space Agency (ESA) and the Italian Space Agency (ASI). Cassini was launched on October 15, 1997 and has been in orbit around Saturn since July 2004. Add one more ring for Saturn! Scientists discovered a faint, new ring circling the planet Saturn. The ring appears to be composed of debris from two of Saturn’s moons when meteoroid impacts occurred. 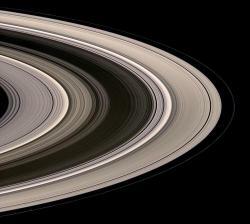 Just in case you are wondering, the exact number of rings around Saturn is not known. might host rivers or oceans of methane and ethane, scientists have determined that its surface is "dry as a bone." These chemicals abound in Titan's smoggy atmosphere, which is similar to the atmosphere of early Earth. Scientists have hoped the moon might provide clues as to how life began on our planet. Early radar studies suggested that Titan was covered with pools of methane, a flammable gas on Earth but liquid on Titan because of intense atmospheric pressure and cold (atmospheric pressure near the surface is about 60 percent greater than Earth's!). Last year, the Cassini space craft arrived at Saturn's surface and also observed liquid-like features on its moon. Why is Titan sending mixed messages? One researcher said: "At one time, maybe a liquid water and ammonia mix flowed onto the surface of froze. That could be smooth on the scale of radar but rough on the scale we see." Another possibility is that Titan's rivers and lakes evaporated long ago and left flat plains of organic material. Organic particles from Titan's atmosphere might also have settled in low-lying areas, creating smooth lake-like surfaces. The latest measurements of Titan (done with the Keck II telescope in Hawaii) focused on the southern hemisphere; scientists believe it's still possible that organic material exists in the north. Titan is the largest of Saturn's 19 moons, and the second largest moon in the solar system. It's rivaled only by Jupiter's moon, Ganymede. Although Titan is classified as a moon, it's larger, too, than the planets Mercury and Pluto. Click here to view a movie of infra-red images (representing heat variations in the atmosphere) of Titan made with the Hubble Space Telescope.